Unstuffed Thanksgiving: some healthy twists on tradition. Healthy food is not the most popular kid in school. And when you are the one who brings healthy options to the holiday dinner table, chances are you won’t be winning any popularity contests, either. It’s a bitter reality, and it makes me sad. It just seems backwards. Take a few Thanksgivings ago, for example, when I made stuffing from scratch. Everything was fresh, down to the homemade, whole-grain bread crumbs and fresh herbs. Of course, it was devoured, but was it remembered the following year? Nope. Could it be that my sales skills are lacking, despite my day job in advertising? Who knows? Ultimately, I think it all comes down to the simple fact that people want what they know and what they are used too. The holiday table is the last place people want to accept change, let alone be reminded to eat well. Sam Sifton of the NY Times put it best in last week’s Thanksgiving themed dining section: “Situational awareness is a Thanksgiving guest’s closest friend.” So when you show up with a bowlful of brussels sprouts, don’t expect to be the life of the party. Although, truth is, it’s a worthy trade-off. Even if the healthy dishes are not the ones spoken about or remembered or begged for the following year, with some exceptions (see note)*, at least they won’t lead to bloated bellies and unwanted numbers on the scale. Deep down, it’s a win. Like the smart kid in school who gets the last laugh. My roasted brussels sprouts and pumpkin mousse did not hold a cinnamon scented candle to the stuffing and mashed potatoes and spectacular orange cake made by my mom, mother-in-law and aunt, respectively (I promise to track down that orange cake recipe to share with you because it’s unreal – or as some of the guests described it “outrageous”). But at least the healthy options were guilt-free, which is a rare treat on Thanksgiving, so I’ll take it. For the brussels sprouts (which make a cameo in the background of the pumpkin mousse pics), I used a simple recipe with balsamic vinegar adapted from Kalyn’s kitchen. It’s super easy yet unique, and it really showcases the brussels sprouts in all their glory. Next time, I’m going to try an even more basic version similar to Ina’s, with nothing more than olive oil, kosher salt and pepper. No recipe is really required for this one. The key to cooking brussels sprouts is to use a really hot oven and roast them until the outer leaves start to crisp. This gives them the effect of a potato chip minus the regret. You can actually get a similar (equally delicious) result using kale. It’s a simple technique that can turn even the pickiest eater into a brussels fan. 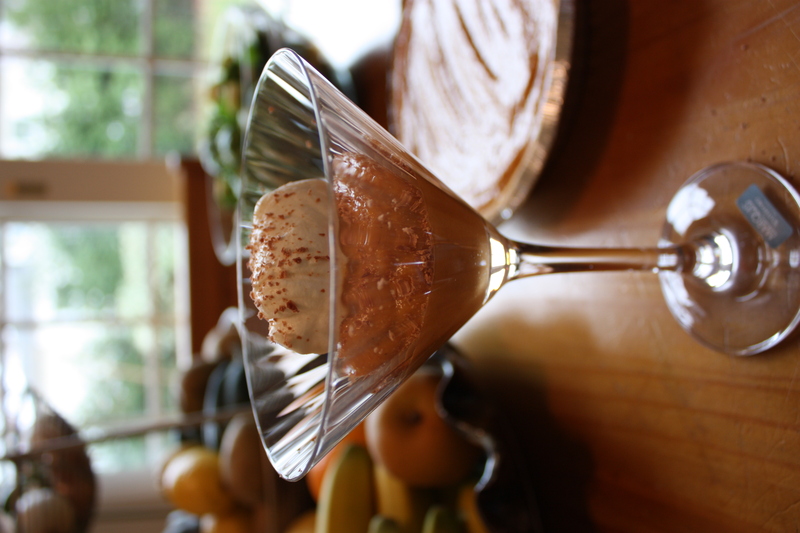 The pumpkin mousse could be a post unto itself. If it was, it would start with the following sentence: No one likes pumpkin pie more than I do. At least in my immediate family. Since I am usually the only one who ends up eating the pumpkin pie at every holiday function this time of year, I decided to save myself future torment. Rather than being left with an entire pie taunting me to dig in fork first (why cut slices if there’s no sharing? ), I made a healthier option. This simple pumpkin mousse is a smooth, spiced dessert I could eat by the bowlful without feeling entirely evil. You won’t even miss the real thing. It’s the perfect pumpkin pie alternative, and so easy to whip up, I’m already trying to come up with excuses to make it all year round. Pumpkin is a superfood, so it can’t hurt, right? Just try it out. And if you haven’t checked out Clean Eating magazine, it is filled with amazing, healthy, recipes anyone would love. In a food processor or blender, combine pumpkin and tofu. Process until smooth, about 30 seconds. Add maple syrup, cinnamon, ginger, nutmeg, cloves and salt. Process until combined, about 30 seconds more. Transfer to a resealable container, cover and refrigerate for at least 4 hours. Keep refrigerated until ready to serve. Before serving, drain any excess liquid that has accumulated on the surface, and give the mousse a quick stir. Spoon into serving glasses and top with plain Greek yogurt (or fresh whipped cream, since it is still the holidays, after all). Garnish with dark chocolate shavings. Using an electric mixer, beat cream and sugar together until it forms soft peaks. Spoon onto mousse and enjoy. It’s so easy, I don’t know why anyone would ever buy the canned stuff. *Note: My personal goal is to make the healthy dish that beats the odds and steals the show. It is possible. It just didn’t work out this year. Although, I shouldn’t sell myself short. There was one lowly healthy dish that did manage to rise above the ranks and live up to it’s butter-laden counterpart: the triple corn spoon bread from one of my previous posts (scroll down past the puppy pic). This dish proves that you can still make something decadent and delicious without inordinate amounts of butter (sorry, Paula). Gallery menu for my dad: dips and cupcakes fit for a crowd. Andrea, it was great meeting you at Beth’s cookie swap! It’s so true! When done right, they are so good! !